Prime Minister David Cameron has so far proved inimitable, despite having been in the public spotlight for years. This is odd: you have to go back half a century to short-term caretaker Alec Douglas-Home for a Prime Minister who lacked a well-known impersonation; and before him Macmillan, Churchill and Chamberlain are still occasionally mimicked. This is an easy defence, and I don’t quite buy it. 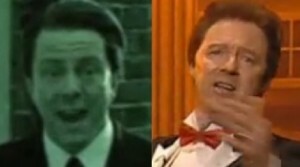 I think people can recognise David Cameron’s voice. Admittedly it’s not as out-of-the-ordinary as, say, that of the hyponasal/velarised Leader of the Opposition Ed Miliband. But I seem to remember John Major (PM 1990-97) being considered inimitably bland until someone hit on the brilliant idea of giving Kermit the Frog an Estuary accent, which did the trick. I suspect there’s a trick out there for Cameron. Is there any advice to offer? McGowan may be onto something with “airy”, if he means a kind of “expanded cavity” voice. This is characteristic of the actors Sir Donald Sinden, Patrick Stewart and Morgan Freeman, though they all have low-pitched voices, while Cameron’s, as McGowan rightly points out, is relatively high. 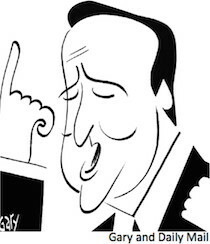 I do hear Cameron’s LOT vowel as very far back. Alistair McGowan talks interestingly about the physicality of impersonation in this interview, also making the point that it’s easier to mimic someone older than someone younger. Both McGowan and Bremner are older than Cameron, who possibly requires a younger impressionist and/or one who naturally bears him a greater resemblance. 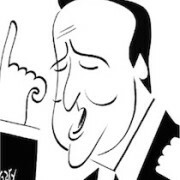 https://www.englishspeechservices.com/wp-content/uploads/2012/01/cameron_gary.jpg 244 210 Geoff Lindsey https://www.englishspeechservices.com/wp-content/uploads/2019/03/blue-mono-logo-small.png Geoff Lindsey2012-01-04 19:52:212016-07-01 23:31:56Can’t anyone do Cameron? Who doesn’t have an apical [t] in “toxic”? I can imagine a laminal [t], but I’m not familiar with accents that have that. And Indian English can have a retroflex articulation, but isn’t that still technically apical? The Standard British [t] is laminal-alveolar, i.e. a stopped version of [s]. This is why t-bursts are often like brief, abrupt s-sounds. Listen to the speaker saying liabilities in the middle of this post. His [t] is somewhat affricated [ts] in a way which reveals its laminal-alveolar character; this kind of affrication is quite common in Standard British. You’re absolutely right that the retroflex articulations of Indian English are apical. When the tongue is curled back, it is the tip and not the blade which will touch the palate. Sorry to point this out, but there’s a typo in the final paragraph: ‘should practice speaking’. Thanks John, no apology needed. I use this verb very frequently and am constantly flipping between clients using BrE and AmE models.